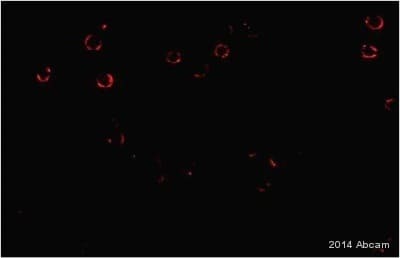 Purified human mannose receptor from human placental tissue. Stains extracellular domain of Mannose Receptor. The Mannose Receptor (MR), a member of the vertebrate C-type lectin family, is a pattern recognition receptor that is involved in both innate and adaptive immunity. The 180 kDa transmembrane protein consists of 5 domains: an amino-terminal cysteine-rich region, a fibronectin type II repeat, a series of eight tandem lectin-like carbohydrate recognition domains (responsible for the recognition of mannose and fucose), a transmembrane domain, and an intracellular carboxy-terminal tail. The structure is shared by the family of multi lectin mannose receptors: the phospholipase A2-receptor, DEC 205 and the novel C-type lectin receptor (mannose receptor X). The MR recognises a wide range of gram positive and gram negative bacteria, yeasts, parasites and mycobacteria. The MR has also been shown to bind and internalize tissue-type plasminogen activator. MR's are present on monocytes and dendritic cells (DC) and are presumed to play a role in innate and adaptive immunity, the latter via processing by DC. 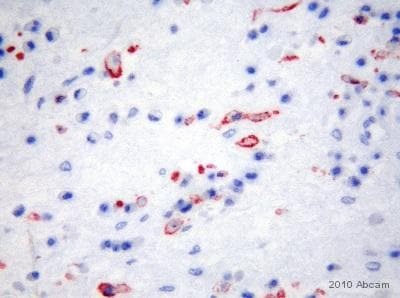 The expression of MR as observed in immunohistology is present on tissue macrophages, dendritic cells, a subpopulation of endothelial cells, Kupffer cells and sperm cells. Our Abpromise guarantee covers the use of ab8918 in the following tested applications. WB 1/50. 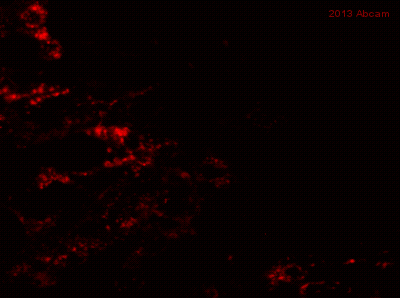 Detects a band of approximately 175 kDa (predicted molecular weight: 166 kDa). This antibody can be use for ligand-receptor intervention studies. Inhibition Assay Use at an assay dependent concentration. Antibody 15-2 functions as an inhibitor of binding. The antibody was functionally tested by preincubation of immobilized receptor with antibody. This prevented binding of t-PA to immobilized receptor. Frozen sections of human tonsil. 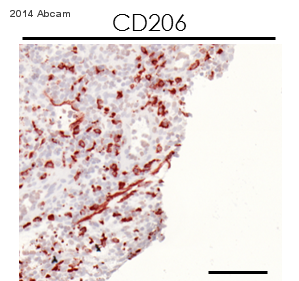 ab8918 was used in a dilution of 1/25 and shows staining of endothelia of lymph vessels. 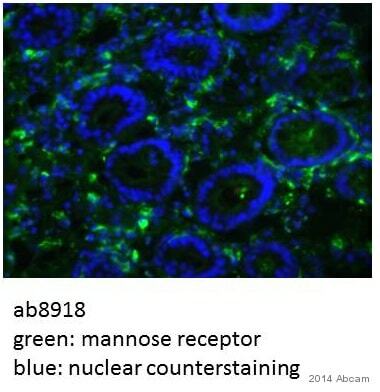 ab8918 staining Mannose Receptor in human mammary gland tissue section by Immunohistochemistry (Frozen sections). Tissue samples were fixed with 70% Ethanol and blocking for 10 minutes at RT was performed. The sample was incubated with primary antibody (1/10) for 1 hour. A HRP-conjugated mouse polyclonal to mouse IgG was used undiluted as secondary antibody. ab8918 staining the Mannose Receptor in Human nasal polyp and tonsil tissue sections by Immunohistochemistry (resin-embedded sections). The tissue was fixed in acetone and inhibitors and embedded into GMA resin. Samples were incubated with primary antibody (1/400 in Tris buffered saline) for 18 hours at 21°C. A Biotin-conjugated Rabbit anti-mouse polyclonal (1/1000) was used as the secondary antibody. 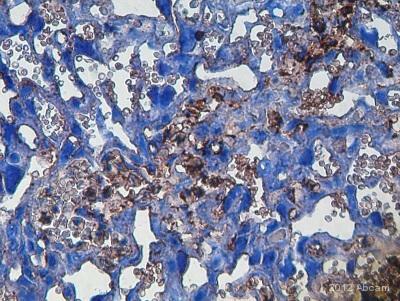 Immunohistochemical analysis of murine uterus tissue sections, staining Mannose Receptor with ab8918. Tissue was fixed with paraformaldehyde and blocked with 3% BSA for 30 minutes at room temperature. Samples were incubated with primary antibody (1/40 in 1% BSA) for 1.5 hours. 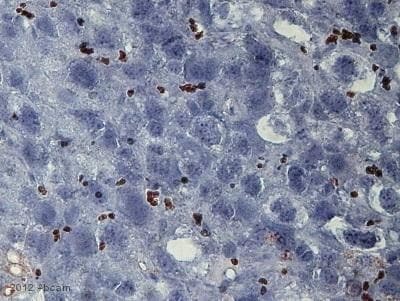 An undiluted HRP-conjugated rabbit anti-mouse polyclonal IgG was used as the secondary antibody. 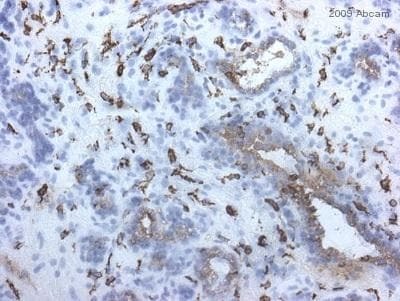 ab8918 staining Mannose Receptor in human endometriosis tissue sections by Immunohistochemistry (IHC-Fr - frozen sections). Tissue was fixed with acetone and blocked with 10% serum for 1 hour at 22°C. Samples were incubated with primary antibody (1/10 in PBS + 1% NGS) for 16 hours at 4°C. 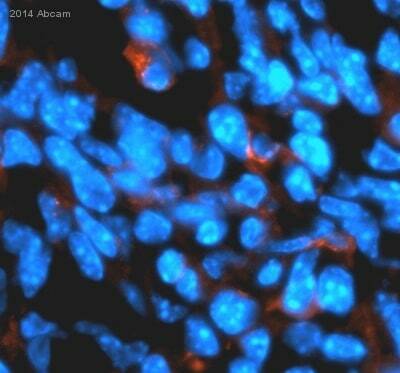 An undiluted HRP-conjugated goat anti-mouse IgG polyclonal was used as the secondary antibody. Nasal polyp, tonsil and bronchial biopsies.